Came across this interesting table from Lifetime. One half is like their typical table, the other half made to hold hot items like a camp stove. 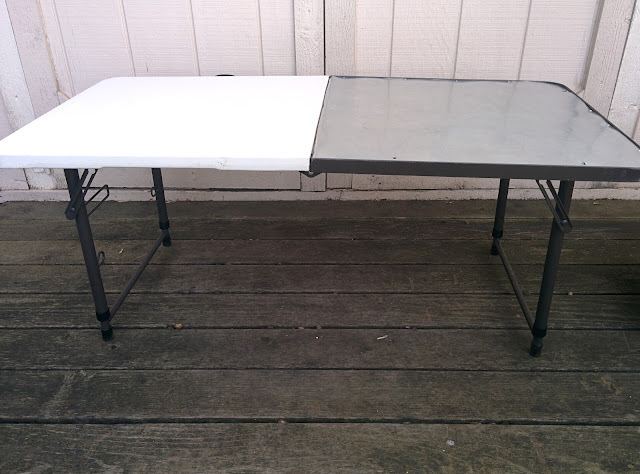 I've had really good expereinces with Lifetime products (tables, shed) in the past, but have no firsthand experience with this particular product. Wife and I have been looking at fold up / roll up tables. This is a really nice one but, unfortunately, no longer available per Lifetime website? At least link to buy returns no ability to buy and the other 4ft table with extension is no longer available. Wow, who'dathunkit? I've never seen one there but that is cool. If I ever see one in a store I probably won't be able to resist. Thanks for sharing Herb. That's a great idea. So far I haven't melted the one I have that's plastic on both sides, but I could see that happening. Bigger version of the Lifetime table. Not lightweight by any means though. Going to have to really think about picking this one up. Folding legs, light weight, has a handle, adjusts to four heights. Used on NorCal meet up and it worked really well. 2' x 4' top, 2" thick when collapsed. Woo-hoo, scored one of these as an X-Mas present. Nice and sturdy like all Lifetime products that I've come across or owned. Now to justify a trip to test it out, but so far it is earning its keep as a Lego building table for my son (the solid side). I just picked up one of the folding 4' ones with the handle also. I'm using it as a temporary in van kitchen setup till I build one. I have a bag sink and an electric waring pro stove top. So far no problems with the stove. Haven't tried using it with my Coleman propane stove yet but I will this weekend. That one you have with the grilling side though looks awesome. I'm looking forward to hearing how you like using it! My next attempt was to cover the mesh top with a sheet of 24g galvanized sheet. This worked great, and I could even put coals right on it and use it as a Dutch Oven table, but it made the thing REALLY heavy (that table already a bit heavier than the all-plastic variant). My last project was to turn the table into a "stand" table for my chuckbox. I'd previously had my chuckbox mounted to a set of legs from a folding sawhorse, but I found that deploying the legs while also dealing with the heavy chuckbox was a pain. Instead, I've made a "mini-table" by significantly narrowing the frame and using a 1/2" birch-ply top. It folds down to 12" x 20" x 3" and is much lighter and easier to setup than the old sawhorse leg system. The folding and latching all works the same, and I only had to cut and re-weld 4 tubes.